In today's installment of the series, we present you with an interview with Dark Heart of Uukrul's co-designers, Ian Boswell and Martin Buis, as well as a brief retrospective introducing the game. Corrupted by the evil wizard Uukrul, the underground city of Eriosthe is but a shadow of its former self, its passages now twisted beyond a mortal's understanding. 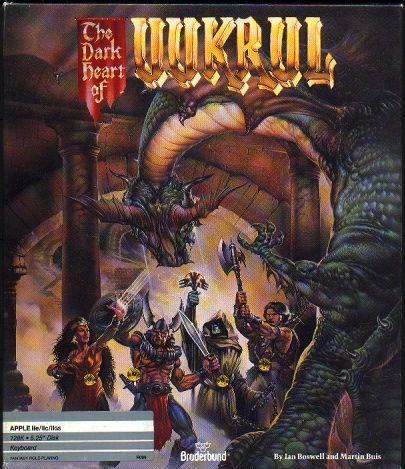 The Dark Heart of Uukrul, a first person turn- and party-based dungeon-crawling CRPG with top-down Goldbox-like combat developed by Ian Boswell and Martin Buis and released by Broderbund in 1989 for Apple II and PC, entrusts you with a single task: cleanse Eriosthe of evil, no matter the cost. And the cost will be high, probably higher than you imagine; Uukrul knows you are coming, and he will be prepared. It is a triviality that bears repeating that the role-playing genre is far from monolithic: there are different kinds of CRPGs that focus on different things. To those who, like me, prefer CRPGs that are about abstraction rather than simulation, Dark Heart of Uukrul is pretty much a perfect game. It does not aim to model a superficially "realistic" NPC behavior, nor offers an "interactive" story or appeals to the player's emotions in an awkward attempt to get personal. 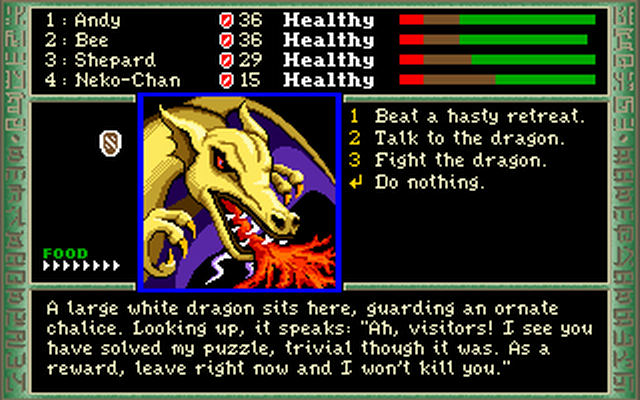 It is aware that, much like a wargame, a CRPG is a mental exercise first and foremost, an abstraction of a task solved through character progression in the broad sense, one discarding everything superfluous and relying on a strict system of several abstract elements that both support and limit each other: character development, dungeon design, and combat, each of them a "puzzle" of its own, representing the various challenges your characters overcome in their progress, as well as a piece of the overarching logic that you must figure out to master the game. Dark Heart of Uukrul's achievement lies not only in the unorthodox ideas inherent in each of these components - it features some of the best dungeon, puzzle and character development design in the history of the genre - but also in balancing them in a way that accentuates their strengths and melts them into a highly challenging and memorable whole. Enumerating the individual accomplishments and clever design decisions made by Dark Heart of Uukrul is a challenge in itself. If I had to compile a list of the genre's most unique and eventful dungeons, the ones that made a lasting impression on me, it would inevitably have to include not just one or two, but several or even most of Dark Heart of Uukrul's dungeons. The Cube, designed independently of Wizardry IV's Cosmic Cube and, in contrast to the latter, in "true" 3D so that the overall layout is seamless and makes sense; the infamous Crossword with its elegance and Hearthall with its sophisticated simplicity; the Pyramid with its remarkable card system; the exhausting Caverns with more to them than meets the eye; the oddness of the Battlefield maze with a spinner trap that haunts me still; the Great Engineer, a dungeon that makes full use of your imagination with its environmental hazards; the Palace, a "meta" role-playing area emphasizing the concept of chance via the roll of a die; and finally the Chaos, the most unorthodox and ingenious level ever created for a CRPG, encounter-free and illusion-based yet logical and perfectly climactic, alone worth a full playthrough of the game. The game shares with Chaos Strikes Back the unrivaled feeling of a living and highly dangerous environment that makes the dungeon as such, and not just Uukrul, your antagonist, which is further underscored by the game's ending that I'm not spoiling for you here. There is a sense of exploration to the game that keeps you on your toes and makes you look forward to discovering what new and unexpected tricks the next dungeon section has to offer. The plot exposition also adds to that. Apart from the backstory given in the manual, the plot - in which you attempt to uncover the fate of the previous expedition that braved Eriosthe and disappeared - is presented to you via a series of visions, as well as notes and clues scattered throughout the dungeon. First person when in exploration mode, Dark Heart of Uukrul switches to top-down for combat encounters, played out on a battlefield representing a zoomed in view of the surrounding dungeon area. The game emphasizes teamwork in a way that other CRPGs rarely do, requiring each of your characters' input into combat, puzzle solving and plot-related activities, which however comes at the cost of making the party composition fixed, so that your group inevitably consists of a Fighter, a Paladin, a Magician and a Priest, their starting attributes and subclasses determined by a Q&A character creation system reminiscent of that made famous by Ultima IV. And while the first two classes are fairly traditional in their roles and abilities, the magic system is where Dark Heart of Uukrul shines again. Both the priest and the magician not only gain levels, they also gain in the number and quality of rings equipped, with each one dedicated to specific deities or magic arcana, ranging from iron to crystal. Obtaining new rings is, in many ways, a different form of levelling up, but one that is woven in much more tightly to the exploration process and whose specifics you must discover for yourself. The priest relies on prayers instead of spells, and not only do the prayers, being more of an appeal to a god than magic in the traditional fantasy sense, have a chance of failure, you must also decipher the purpose of each prayer, and this is no trivial task. And whereas the strength of many a CRPG's character development system draws more often than not on an established ruleset, be it D&D or whatever else, Dark Heart of Uukrul is an infrequent case where an attempt to come up with a "homebrew" system makes for a strong and engaging experience. 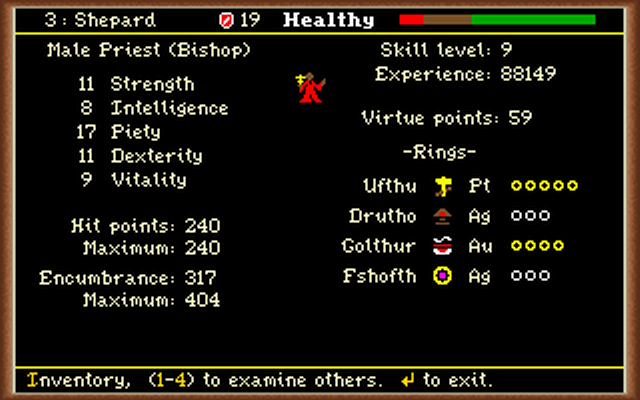 Alongside such games as Wizardry IV, Dark Heart of Uukrul is what used to be called an expert level scenario, not only in its combat, puzzle and dungeon design, but also in the save system the designers developed for it, arguably the most optimal to date. All through the game the party will come across sanctuaries, acting as places to rest, save and recuperate. These act as checkpoints, as although you can save between sanctuaries, those saves are overridden upon entering combat and character deaths. That means you can choose to play with permadeath according to the designers' original vision, making death meaningful but not in a way that is forced on you, and you can also save on exit so that your progress doesn't get lost whenever you have to quit the game to attend to more urgent matters. Can you tell us a bit about yourself and how your decision to develop a computer role-playing game came about? Did you come from pen and paper RPGs? Ian Boswell: Martin and I were both studying Computer Science at Auckland University in the early 80s. We had played Wizardry I and II on Apple II, I think this would be 1982, and we were definitely inspired by that game, but at the same time we didn’t see anything that was technically beyond us. We had many ideas for ways that it could be done much better. It started as a spare time project, something we could tinker with, and we would see where it went. I think if we’d known how much time it would end up taking, we’d probably never have started! We were both really keen on text-based adventures at the time, especially the intellectual aspect, the puzzle solving. There was very little of that in Wizardry, and we knew from the start that our (as yet unnamed) game would have the flavour of a puzzle-based, storytelling type adventure, not just a straight RPG. 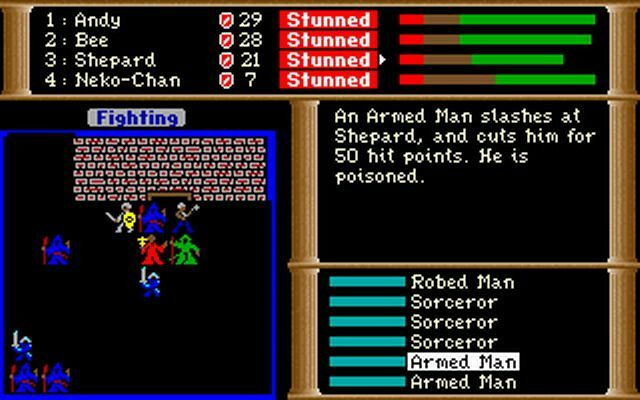 I had played almost no pen-and-paper RPGs, though Martin had some experience with them. That wasn’t a bad thing. We agreed that we’d only follow the expected “rules” when it made sense, not be bound by what the D&D rulebooks said. Martin Buis: I’d done wargaming and some D&D through school, and was a big fan of SciFi and Fantasy fiction, so the general area was one that I enjoyed. I’d made dice-based games too, and enjoyed the creation of the ruleset as much as the story and the interaction with other players. Ian and I met because we were doing both Comp Sci and music, and I remember playing Wizardry and working on projects day and night. You co-designed Dark Heart of Uukrul. What were your roles on the game? Ian Boswell: We both had a hand in most things. I did more of the programming, and Martin did more of the plotting and design. But the most creative stuff usually emerged from collaborative sessions and many cups of coffee. The maze design – which is huge – was broken into regions, one region being the area you explore between two consecutive sanctuaries. Mostly, one of us took responsibility for the detailed design of a given region, then when it was ready brought it back to the other for playthroughs and fine tuning. This is why many of the regions have a distinct theme or tone to them. Each of them “feels” different. We also had to develop a lot of the required code libraries and design utilities that we needed. There was almost nothing available off the shelf, or open source, back then. Martin Buis: We started out with more or less equal roles, but specialized as the project progressed. Ian was a fantastic developer and ended up doing all the code – I doubt that any of my code survived into the released game. I remember that Ian designed and wrote the maze drawing algorithm, which involved perspective views and hidden surface removal both of which were state of the art, in 6502 assembler in a single shot and that at the end of coding there were only two bugs that needed to be fixed. I don’t think I’ve ever seen an equivalent feat of programming. Broderbund was not exactly known for its role-playing games. How did you come in contact with them? Did they influence the final state of the game or the development process in any way? Ian Boswell: When we had enough of the game working that it could be demonstrated, we asked a business acquaintance to show it around to a few publishers while on a trip to the States. The publishers were all based in California. We were in New Zealand, and communication with distant countries was a lot harder back then – no internet! It turned out that Broderbund was actively looking for a fantasy RPG title, to respond to competitors like Wizardry and Ultima which were creating quite a buzz at that time. They liked Uukrul, and signed us up almost on the spot. I guess it was partly lucky timing. Regarding influence… well their major influence on us was to get us to finish the thing! There was an awful lot of work still to be done, with just two people working in their spare time. They drove us to get it completed, but they were never too overbearing. And to their credit they never interfered with our creative control. They wanted to release the title while the RPG market was still hot. Sadly, by the time it was ready, we’d missed that window. Martin Buis: We showed it to Broderbund, Electronic Arts and Activision. Broderbund were the most interested and helped with the art work as well. They were a great partner, but I think that working with a New Zealand based software house (well couple of students), was something that was new to them. In retrospect, we missed the sweet spot for the Apple market, and while we then made a port for the PC, Uukrul never established a strong brand or got great marketing. What were your goals with Dark Heart of Uukrul? What did you set out to do with it, and what were some of the RPGs, computer or pen and paper, that influenced the game's concept and design? Ian Boswell: I guess my first goal was just to see if I could handle a creative project that big. It was also a nice alternative to getting a real job. Dark Heart of Uukrul is widely considered one of the most challenging CRPGs out there. Was it your intention right from the start to create an expert level scenario? What prompted that decision, and why the emphasis on puzzles? Ian Boswell: I didn’t realize it was considered one of the most challenging. But that’s nice to know because we did set out to make the game memorable, and the things the player remembers most are solving challenges, not hacking up monsters. It’s the puzzles and the plot that people remember. Both Martin and I were fond of puzzles and intellectual challenges, so we imbedded some of our favourites into the game, and created new ones of our own. The very best puzzles, I find, are ones where you see the pieces, but the “big picture” is hidden from view until you put the pieces together the right way, and then the logic dawns on you and everything makes sense. Martin Buis: One of the design points we really wanted to get across was that dying was a really big deal in Uukrul, and that this would drive combat and exploring to be more emotionally charged and encourage times when the player would be aggressive and times when the player would be cautious. This meant that there had to be consequences to death, and even some fatal traps that you couldn’t escape. We were loathe to allow backups and reincarnation as these would weaken that feeling. Playing the game, and reading walk-throughs, I’m pleased that this aspect of the game comes through. One of the most famous and ingenious puzzles in Dark Heart of Uukrul is the crossword puzzle. Who came up with the idea and how tricky was it to implement it? Ian Boswell: That was me. I’ve always liked cryptic crosswords, the sort where each clue is a little puzzle in its own right, words which look like nonsense until you read them the right way. Coincidentally, a crossword grid can look like passages crossing each other in a dungeon map. So I decided to design a region where the passages formed a crossword, and build a multi-layered puzzle around that. Dark Heart of Uukrul features some of the best dungeon design in the history of the genre, up there with such games as Wizardry IV or Chaos Strikes Back. How did you go about designing the dungeons, and what are the ones you remember the most fondly? Ian Boswell: We didn’t want the maze to be constrained in a box, made up of levels, with each of them square. That seems very artificial. We wanted it to sprawl and spread out, including going up and down as well, like real caves and tunnels would. With a simple grid co-ordinate trick, we were able to implement this. It makes exploring the dungeon regions a lot more mysterious, even scary, because you have no idea where it’s going to lead or how far you are from your goal. For the player, mapping it becomes really challenging too. Some of the regions are small, some are huge. Each has its own flavour, supported by the story narrative, and a design approach which makes each region feel different as you explore it. The ones I remember most fondly are the Crossword Puzzle and the Chaos, and I see these are two that you’ve asked specific questions about. Both of them are so unlike what you expect to find in an RPG, yet both have an intricate design logic to them which becomes the very puzzle you have to solve. Martin Buis: The levels also tell a story and have a real location, so we wanted to convey a real sense of space through their spralling layout, or indicate that you’d reached a new area by a change in architecture. We were too constrained to do much with the visuals, so that was conveyed in the layout. I'd also like to talk about the Cube, which was, I assume, influenced by Wizardry IV's Cosmic Cube. How did you approach designing it? Ian Boswell: Uukrul predates Wizardry IV, so there was no influence from it. I think the cube was Martin’s design. Another nice twist, because most of our dungeon spreads and sprawls over a wide area. But this region is just the opposite, packed tightly into a perfect 7x7x7 cube. Mapping and navigating it is challenging because there aren’t many standard passages, but there are a lot of vertical transitions. That opens up spatial puzzling. Designing it was the opposite of playing it – map it all out carefully first, then work out where the passages have to be. Another dungeon I'd like to discuss separately is Chaos, the final dungeon. Encounter-free, it relies exclusively on illusions and finding an underlying logic to them. As such, it is one of the most unique dungeons in any CRPG. Was there anything in particular that inspired it? Ian Boswell: Yes, we loved working on this one. Another twist, it’s the exact opposite of what you expect at the climax of an RPG. You’ve almost got to the end, your party has built up all these immense powers, vast wealth and treasures, the greatest weapons and the most potent magic… and it’s all useless. Nothing can get you through here except your wits. I can’t recall what the specific inspiration would have been, but we both liked doing things that were unpredictable. Our dungeon mapping engine allowed us to implement some weird tricks, doing things with (x,y,z) co-ordinates that wouldn’t map correctly to real space. We’d largely avoided anomalies like that in the rest of the dungeon (although I think there was one “infinite” corridor somewhere!). But, hey, climax of the whole game, let’s have some fun. Walking around the Chaos really feels strange. You even feel scared to take a step forward because you may not be able to get back. But, it is a puzzle, not just random squares. It does have logic, and working that logic out bit by bit, through observing what happens where, reveals a satisfying solution. You mentioned that the Chaos has no monster encounters at all. They would have been irrelevant at this point in the game, but in fact we had to eliminate them for a technical reason as well. The deliberately fractured nature of the dungeon mapping here would have broken our combat engine! Dark Heart of Uukrul's character development is quite unorthodox, especially as far as magic users are concerned. Both the priest and the magician gain not only in levels, but also in the number and quality of rings equipped, each dedicated to specific deities or magic arcana. Obtaining new rings is a different form of character progression, woven in tightly to exploration and combat. What were the influences and the rationale behind this system? Ian Boswell: I remember that whole system came to me while I was waiting at a bus stop, and there was a woman waiting there who was wearing these big, gaudy rings on every finger. In the game, the rings give a tangible measure of progression through magic powers, or spiritual powers, more structured than the usual D&D spell progression. Each finger represents a discipline or deity, and the metal of the ring on that finger represents the level of spells or prayers you can access. Speaking of the magic system, how did you come up with it (and is there any meaning to the spell and prayer names)? Ian Boswell: I liked the distinction between spells and prayers. The Magician’s spells are reliable, if you have the ability to cast it (ring and points), a spell will work. But the Priest’s prayers are not reliable, they are merely pleas to the deity to act on your behalf. The prayers are potentially more powerful, and certainly more mysterious, than the magic spells. With a few of them, even working out what they do is a puzzle in itself. For the most part, the spell and prayer names are just invented words or families of words. But there is the odd hidden joke, like “muzaq” which is a spell that brings forth a terrible noise. Martin Buis: For the powers, we looked at all the variables and algorithms involved in the game and figured out how we could turn them into interesting spells. We even tried to do some forward looking time travel in the scrying mirror, since we knew the puzzles and the story was quite linear, we could infer what the player would be up to soon. 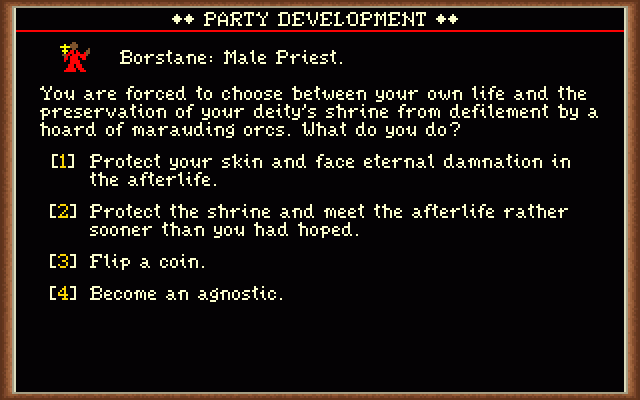 There is character creation in the game (the starting statistics for the party are determined by the player's answers to a number of questions, similar to the system used in Ultima IV), but the classes are fixed: every party consists of a Fighter, a Paladin, a Priest, and a Magician. What prompted this decision? Was it an emphasis on teamwork and cooperation between the classes? Ian Boswell: The overall plot progression requires the party to have one of each character class. We placed plot points through the game where (say) the vision of Mara would speak to the Magician, revealing vital information. That’s problematic if your party has no Magician. Also, I think it wouldn’t be possible to complete the game with one of the character classes missing. There are spells and prayers for example that are essential, and you’d not survive combats without a Fighter. 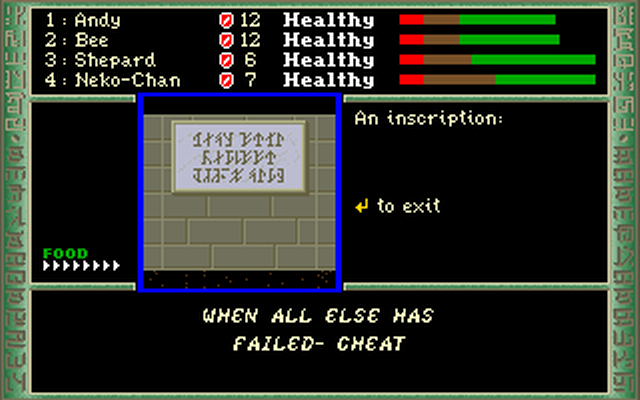 Dark Heart of Uukrul features a very advanced save system, arguably the most optimal to this day. Through the game the party comes across sanctuaries, acting as places to save and rest. These act as checkpoints, but you can also save anywhere between sanctuaries, even though those saves are overridden upon entering combat and character deaths. What was the philosophy behind the save system? Ian Boswell: Personally, I was never comfortable with the approach most computer RPGs take, where if a character dies you just go back to a recent save, then carry on as if nothing happened. I thought death should matter. It should be a setback. If you can erase your mistakes that easily, it encourages reckless play. Similarly, winning a difficult encounter becomes no great reward. Initially, I wanted to have no save/restore facility at all, just save/resume. If you lose a character, he/she is gone for good. You can get a new character of similar level to join your party but the dead one stays dead. Broderbund vetoed that idea, and they were right. So we came up with the Sanctuary system, and it’s a really good balance between having a save/restore facility, and still having a strong incentive to keep your characters alive. The idea to present the plot via apparitions (or visions) of Mara is as memorable as it is rare. Personally, I can only recall one other 1980s CRPG that did something similar: Tower of Myraglen (1987) by Richard Seaborne. Were you aware of that game? Why did choose to go for this kind of presentation? Ian Boswell: I’ve not heard of that game, and we predate it anyway. Maybe he copied us! Mara is introduced early on in the plot as an explorer who has gone before, and therefore knows secrets about what lies ahead. There was no sensible way the party could actually meet Mara – but seeing visions of her allows her to appear anywhere. She moves the plot forward, and gradually reveals clues about the whole story. We made sure the story surrounding Mara was intriguing enough, that we could have built a sequel around it, but the sequel never happened. Dark Heart of Uukrul had some very basic graphics. Personally I did not mind that, but what did that have to do with? Ian Boswell: The graphics weren’t too bad for the era when it was released. If we could have finished the development a year earlier, the graphics would have been really good by comparison with then-current releases. But it’s true that the standard of gaming graphics kept improving, as did the graphics hardware and libraries available to support it. So now it does look really simplistic. If we had produced a sequel I think we would have needed to hire a professional graphic artist. Can you talk a bit about the development process? How long did it take you, and what were the main challenges involved? Ian Boswell: Going from memory here, we were a couple of years at it spare time, while completing University studies, and I spent a year working on it more solidly after that, during which we got signed by Broderbund, so then we had to finish it. But it took more than a year after that. I think challenges we faced were that you had to code everything yourself back then (even wrote our own graphic library in assembler so it would be fast enough), and we had to fit the entire game onto two floppy disks. Martin Buis: Broderbund paid an advance on the Apple version, and we agreed to produce an IBM port, so we put some of that money into ‘hiring’ a couple of our college friends to work on the port. Overall, the process took many years across those two platforms. I shudder to think what the hourly rate would have been! Can you describe the reception the game got and your reaction to it? In retrospect, would you have changed anything about the game? Is there anything you would have done differently? Ian Boswell: When Broderbund signed us up, there was a window where computer RPGs were hot property, but the window didn’t stay open long enough. It took us too long to complete the game, and I’d say we missed the market by 6-12 months. Broderbund published it, but by then RPGs were “last year’s model”. They did little to promote or advertise the game, and it sold only modestly, something around 5,000 copies. The reception from the public however, from the few people that actually know about the game, has always been really positive. Even now 25 years later, I still get an occasional email from somebody telling me how much they enjoyed the game, especially the puzzles! Martin Buis: We had aimed at beating the technical sophistication of Wizardry when we started, but it was a moving target and by the time we delivered we were a little behind the start of the art. I think that the lack of sound was probably a big factor in the game being overlooked in the market place. About the time Uukrul came out Id released Wolfenstein, and everyone’s expectations of what you could do with computers changed. Really, the whole genre of thoughtful games seems to have disappeared, and casual gaming seems to be pushing things further down the ‘stateless’ approach to gaming. After Dark Heart of Uukrul, you do not seem to have worked on any other video game. Why did you decide to leave the industry behind, and what have you been involved with since then? Ian Boswell: I wouldn’t say Martin and I were ever in the industry. It was a spare time project, created on a shoestring budget, and something we can look back on, proud to have completed it. As a business proposition it would have been an utter failure. I think I estimated once that our time engaged on this project had yielded us income of about $2 an hour. So I guess there was never any chance of doing a second game, unless the first one had been much more successful. The first one was done for fun and for pride. The second one would have to be a business proposition. I’m still in the software industry. I now manage a small custom software company, made up of other people who are better at coding than I ever was. One of my business partners is Francois Pirus, who I met through Uukrul. He helped us with coding one of the platform ports. We don’t write games though. The games industry now requires huge budgets, huge teams and huge risk. You couldn’t image a major title coming from two guys working in their spare time. But, interestingly, that could change with mobile platforms. It is conceivable that a game which is simple but ingenious could become a hit as a mobile platform app. Martin Buis: I have stayed in technology also, though I’m not in the gaming industry. I enjoy looking at new games for their mechanics and story, so I buy quite a few games. I’ve enjoyed Portal and Minecraft over the last few years, the first for the story and the second for the community. Do you still play video games, and role-playing games in particular? Are there any that you have particularly enjoyed lately, or any that you tend to return to? Ian Boswell: No, personally, I have left RPGs behind. I might spend a few hours on the occasional strategy or puzzle game, that’s all. However I always figured I might just play right through Uukrul again some day, for the sake of nostalgia. That will probably have to wait until I retire. Great idea. You should call it "Dark Heart of Uukrul Forever". We thank Ian Boswell and Martin Buis for their time! I would also like to thank Alex, Jaesun, VentilatorOfDoom and Zed for their comments on the retrospective.